It’s time to address one of the more controversial subjects related to dinosaur protection: carnivores. It’s no secret these giant creatures have been the main cause of negative press aimed towards dinosaurs. However, we believe that animals are rarely, if ever, to blame for human fatalities. The blame falls squarely upon humans’ exploitation of dinosaurs, as well as their disregard for these animals’ ingrained behaviors and instincts. Scientific research around predatory dinosaurs has shown that these animals are intelligent and delicately care for their young similar to crocodiles. Crocodiles can easily kill prey with their sharp teeth; however, a mother crocodile can also carefully cradle her young in her jaws. Tyrannosaurs are extremely protective of their infants – studies even suggest that Tyrannosaurs might mate for life. Some people like to call dinosaurs monsters, but research has proven otherwise. Those leading the charge against carnivorous dinosaurs often point to the 2015 incident, when Jurassic World’s pterosaurs displayed uncharacteristic levels of aggression toward humans. Paleontologists and animal behaviorists agree these particular pterosaurs would likely not have displayed such behavior in the wild. Millions of years ago, they lived along the shorelines of oceans, hunting large prehistoric fish and small dinosaurs. However, at Jurassic World, they were contained inside an aviary that was not at all tailored to their needs and behaviors. The body of water accessible to them was far too small, and their food was supplied to them, depriving them of much-needed exercise gained from hunting in open spaces. When freed from their enclosure, they instinctually flocked toward the nearest and biggest body of water in order to collect food for nesting. Unfortunately, this led them to the heavily-trafficked main boardwalk of the park. Though this incident was undoubtedly a tragedy, it was not the fault of the pterosaurs – it was caused by a human lack of research and empathy, and has resulted in widespread negative sentiment toward carnivores. Our mission statement here at the Dinosaur Protection Group has always been to fight for the survival of the dinosaurs, and we must do so regardless of their size, species, or dietary requirements. Abandoning the carnivores would doom all dinosaurs – including herbivores – to extinction. Recent studies have shown that carnivores, especially large carnivores, are essential in order for an ecosystem to remain healthy. Areas where the populations of big predators have been depleted suffer from a multitude of problems, as overpopulation of herbivore species can escalate to total habitat destruction if left unchecked, causing the herbivores to perish as well. Once we’ve found a new home for the dinosaurs, we must ensure that all species saved have a fighting chance at survival. To better understand the relationship between predator and prey in dinosaurs, let’s focus on the most infamous ruler of Isla Nublar, the Tyrannosaurus Rex, and its effect on the ecosystem over the years. The female Tyrannosaurus was first introduced to Isla Nublar in 1989 having spent the first year of her life in a small enclosure on Isla Sorna along with several others of her species. The paddock at Jurassic Park was originally built to house two T-rexes, but with only one active on Nublar during the incident in 1993, this impressive animal would remain unchallenged as the island’s apex predator for almost a decade. A Tyrannosaurus of that size requires a large amount of meat every day to survive, and during the years before Jurassic World, she was never without things to hunt. The rate at which this T-rex consumed prey was proportional to the size of the island, which was big enough for some prey to successfully hide from predators, but not too big for the T-rex to lose track of her food sources completely. Despite suffering from a nasty case of Ragged Tooth and mild malnutrition upon her recapture in 2002, this powerful giant had successfully survived by hunting Parasaurolophus, Gallimimus, and a herd of goats that had been abandoned on the island by InGen. By keeping their population numbers at a consistent level, the Tyrannosaur helped maintain a healthy ecosystem merely through her natural predatory behavior. But now she is not alone. 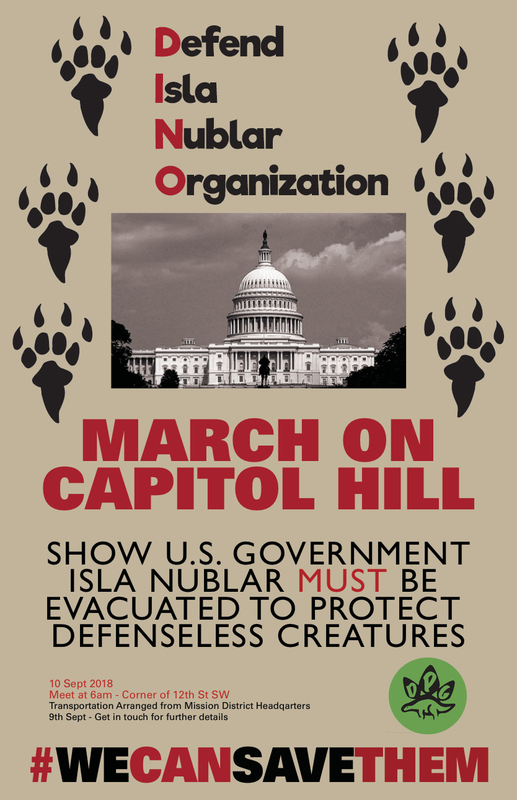 From 2004 onward, and for a considerable time into the park’s operation, Masrani Global transported various dinosaur species to and from Isla Sorna during the construction of the new park, and an entirely new batch of dinosaurs is now left to roam free on Isla Nublar. 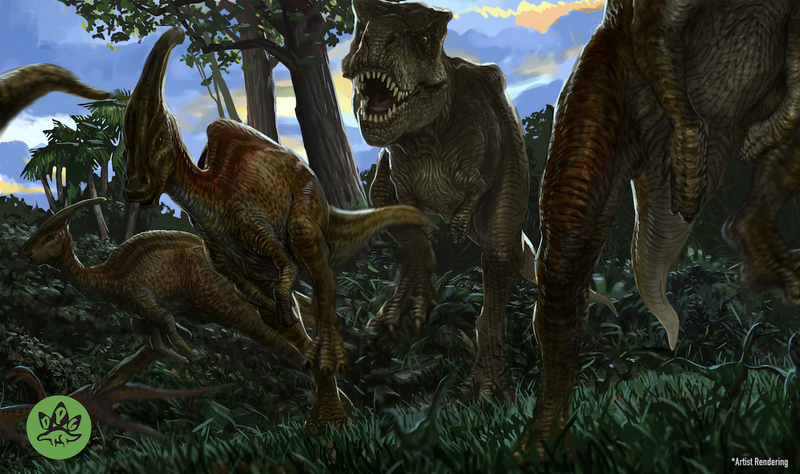 This includes a considerable number of large carnivores, such as Allosaurus and Carnotaurus, who join the Tyrannosaur in the fight for survival under the shadow of Mount Sibo. Isla Sorna is a much larger island than Isla Nublar, and the carnivores that came from there now face not only the wrath of the island’s resident Tyrannosaur, but also an extensive loss of landmass. This change has caused an increase in fatal confrontations between the meat-eaters, resulting in some species falling back into extinction. The most recent carnivore added to the extinct list is the Metriacanthosaurus, which once thrived in the denser parts of the jungles hunting small herbivores. The Tyrannosaurus and the other carnivores require a suitable new home and fast. While options are limited, we believe there is a place somewhere that can support the remaining dinosaurs, so that herbivores and carnivores alike can thrive. If you agree, it is time to join our cause.